Medjugorje parish prays the Way of the Cross on Cross Mountain at 2 pm every Friday, and in the church of St. James every Friday after the evening Holy Mass. 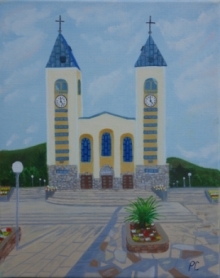 In the branch churches in Šurmanci, Vionica and Miletina, it takes place according to the agreement of parishioners. The Way of the Cross at Cross Mountain began at the beginning of Our Lady’s apparitions, when groups of pilgrims began to pray at wooden crosses that marked the stations of the Way of the Cross. In 1988, bronze reliefs were placed, the work of the Italian artist Carmello Puzzolo. From that time, parishioners and their Franciscan priests every Friday climb Cross Mountain for the prayer of the Way of the Cross.